At the annual NOVA Pumpkin Classic, players usually compete for prize pumpkins. 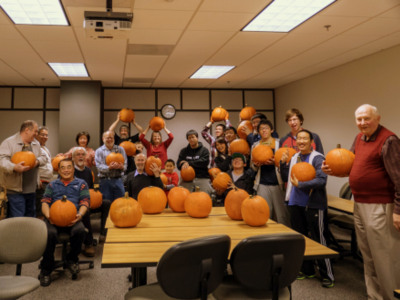 At this year’s Classic, on Saturday, October 25, 31 players vied “not to lose a pumpkin,” a result of a surfeit of squash due to what Tournament Allan Abramson admitted was “A massive lack of communication” between him and NOVA Club President Gary Smith that found them both turning up with armfuls of pumpkins. In the end, every attendee, including visitors, left the George Mason Law School in Arlington VA with a grand pumpkin. Top section winner Josh Lee upped his game to finish 4-0. New visitor Saki Fujita 5 Dan from Japan, now studying at Johns Hopkins, promises to be a tough addition to the local scene. Justin Chiang topped the Austin Fall Classic Go Tournament on Saturday, October 25th at Great Hall Games in Austin, Tx. 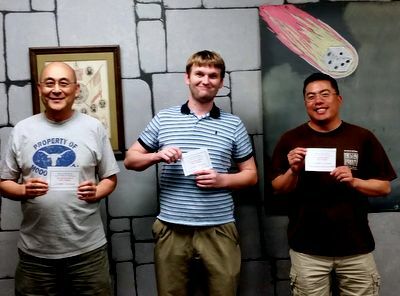 Fourteen players participated in the 4 round, handicap tournament, with prizes going to the following players: Justin Chiang 9K (4-0); Yue (John) Zhyang 4D (3-1), Cye Stoner 2K (3-1). The October 18 Twin Cities Go Club’s Fall 2014 rated games day took place on the University of Minnesota campus, in a building that sits right on the edge of the Mississippi river. “It was a picturesque autumn day – clear skies and a slightly crisp feeling in the air – the trees at the peak of their color, with bright yellow leaves carpeting streets and walkways around campus,” reports Aaron Broege. 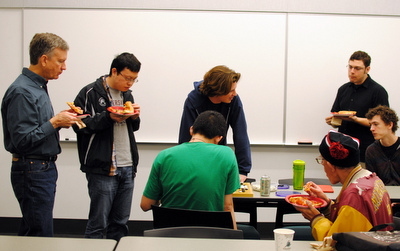 photo: Onlookers enjoy their pizza, courtesy of the AGA, while Peter Hansmeier (4d) and Yanqing Sun (2d) (at left) review their game. Section A winners: Alex Panaccione, 1 dan, and Eric Tillberg, 4 kyu, went 4-0, and thus tied for first place. 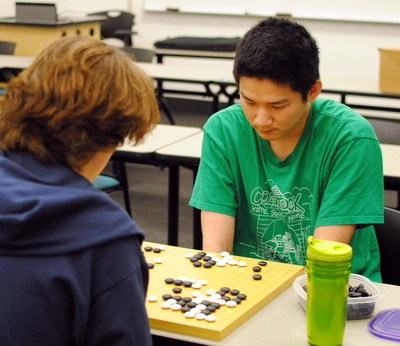 Third place went to David Cho, 3 dan, who only lost to Alex Panaccione. Honorable mention to the others who went 3-0, Pete Schumer, 2 kyu, Alexander Majercik, 3 kyu (who only lost to Eric Tillberg), and Makio Ogawa, 4 kyu. Section B winners: Three players went 4-0 and thus the prize money for first second and third was pooled and divided equally. Tied for first were Milan Mladenivic, 6 kyu, Brandan Williams, 18 kyu, and Jacob Zhang, 20 kyu. 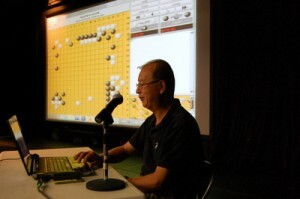 Honorable Mention to the 3-0 players: Chia Chan 5 kyu, Philip Dreher, 7 kyu, Ralph St. Louis, 7 kyu, and Yuan Yao, 10 kyu. Chia, Philip, and Ralph all only lost to Milan. Click here for tournament photos. Dark horse Youwhan Kim 7D, a former Korean insei, won the 2014 Cotsen Open, upsetting 2014 Masters champion Mark Lee in the second round and going on to sweep the rest of the tournament, 5-0. Kim’s play was consistently sharp and tough and he was unfazed by the speedy 20-second overtime, which added pressure to some of his opponents. 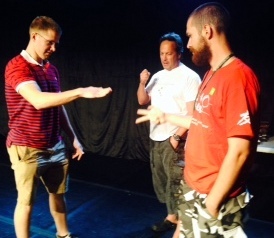 Tournament sponsor Eric Cotsen congratulated the new tournament champion, saying “I like change. Anything that shakes things up at the top, that works for me.” Click here for top-board game records and complete results. Additional photos are on the AGA’s Facebook page. Click here for top-board game records and complete results. Additional photos are on the AGA’s Facebook page. 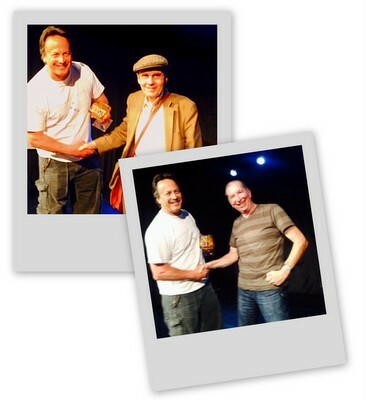 Special Awards: Richard Dolen (top right) and Larry Gross received special awards from tournament sponsor Eric Cotsen for their longtime support and promotion of the game of go. * Sun & Lee were tied for 2nd; Sun was awarded 2nd place by default when Lee missed the award ceremony; Luo and Cho were tied for 4th place and Luo won 4th place in a rock-paper-scissors shoot-out conducted by Eric Cotsen. Cotsen Staff: Samantha Davis & crew: Wenguang Wu, Katie Dicus, Matthew Jarrell, Torey Byrne was photographer, and Jerry Miller. Chris Sira was the Tournament Director. Netherlands: Zeno van Ditzhuijzen 5d took the Indis (Inter-District) Tournament in Amstelveen on October 19. Behind him were Rudi Verhagen 4d in second and Rene Aaij 4d in third. Russia: Also on October 19, the Cup of Japan Ambassador finished in Moscow with Grigorij Fionin 6d in first, Natalie Kovaleva 5d (left) in second, and Dmytro Yatsenko 5d in third. Portugal: Cristovao Neto 1d bested Pedro Carmona 2k at the Open Porto in Lisboa on October 19 while Pedro Pereira 1k came in third. Mark Lee 7D (right), the odds-on favorite to win this year’s Cotsen Open, was upset in the second round on Saturday by Youwhan Kim 7D in a edge-of-the-seat 299-move thriller. 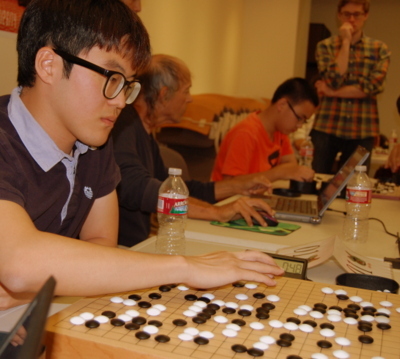 The former Korean insei swept the US Masters 9-0 last August and has been visiting Myungwan Kim 9P in LA since then, where he’s also been teaching go and studying English. The Cotsen is being held in Los Angeles, CA this weekend, with a field of 126 players. 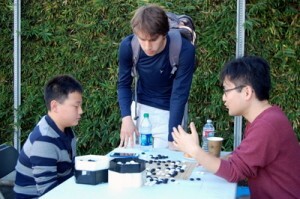 Lee defeated Yixian Zhou 6D handily in the first round Saturday morning but ran into a formidable opponent in Kim — another former Korean insei — in the second round. Kim and Beomgeun Cho 7D (left) won all three rounds on Saturday and now lead the field. Click here for the crosstab and top-board game records. 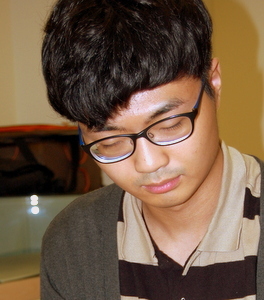 Other top players at the Cotsen include Calvin Sun 7D, Leran Zou 7D and Qipeng Luo 7D. The E-Journal will broadcast the final two rounds live on KGS on Sunday starting at 10:30 am (PST). 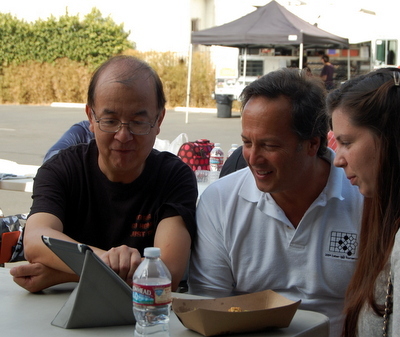 from the Korean Cultural Center in Los Angeles, as well as tweeting @theaga and posting updates here. - report/photos by Chris Garlock; check us out on Facebook and @theaga on Twitter for more photos. You can tell how some go players feel about their game by the expression on their face, nervous if they’re losing or cheerful if they’re winning. But not Eric Cotsen. He always looks happy and excited to be playing, no matter what the situation is on the board. “It’s just the way I am, I guess,” Cotsen told the E-Journal in an interview Saturday morning at the Los Angeles Korean Cultural Center as players registered for the Cotsen Open, which he’s been sponsoring for “about 25 years now.” Cotsen’s proud of the tournament’s “different vibe,” pointing out the free lunches and team of masseuses for players, the refundable entry fee for players who attend both days, and the club team prizes. “I wanted it to be something out of the ordinary,” he says. - report/photo by Chris Garlock; check us out on Facebook and @theaga on Twitter for more photos.